Few things are more delicious in the summer than a perfectly grilled burger. My friends over at NoshOn.It are hosting a whole week of burger recipes from all of your favorite bloggers. 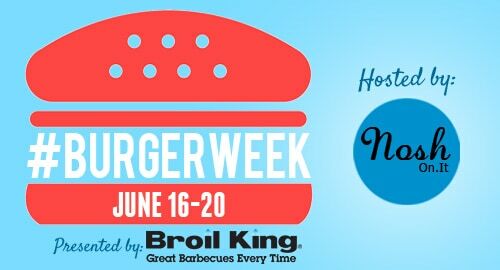 #BurgerWeek is going to be epic! I was so excited when they asked me to participate. I decided to put a fun Tex-Mex twist on a traditional burger because I love all things Mexican food. The Ultimate Fajita Burger is all the glory of a cheese burger with my favorite fajita elements. 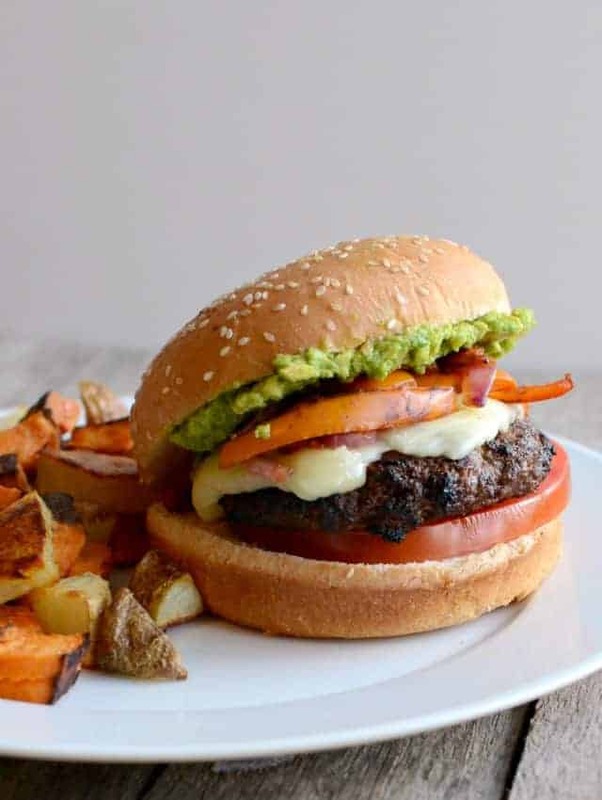 A little spice, some sweet bell peppers, and guacamole make for one killer burger. Everything is better with guacamole! You can see the other blogger’s who are posting today at the bottom of the post, but be sure to check back because this is a whole week of fun. You can click on the burger badge and it will take you to a completed list of everyone who participates this week. That will be one amazing compilation in the end. Mix all of the burger ingredients together in a medium bowl and press into 6 patties. Grill over medium-high heat for 5-10 minutes on each side until the meat is cooked through and the center registers 160 degrees on an instant read thermometer. If you’d like the cheese melted, add it to the top of the burgers 1 minute before they are cooked through. Saute the sliced peppers and onion in the salsa over medium heat until the peppers are cooked through and soft, about 6 minutes. To assemble the burgers put guacamole on the bun top and bottom like you would mayo, add the sliced tomato, burger, cheese if you didn’t melt it, and 1/6 of the pepper mixture. Top with the bun. Repeat with remaining ingredient. Enjoy while the peppers and burgers are hot. If you like a little spice try adding a chopped jalapeno to the pepper mixture before cooking it. Yum! Here are the other posts that are up today! And just in case you needed more than great recipes there’s also a killer giveaway going on right now! That looks bomb.com my friend! 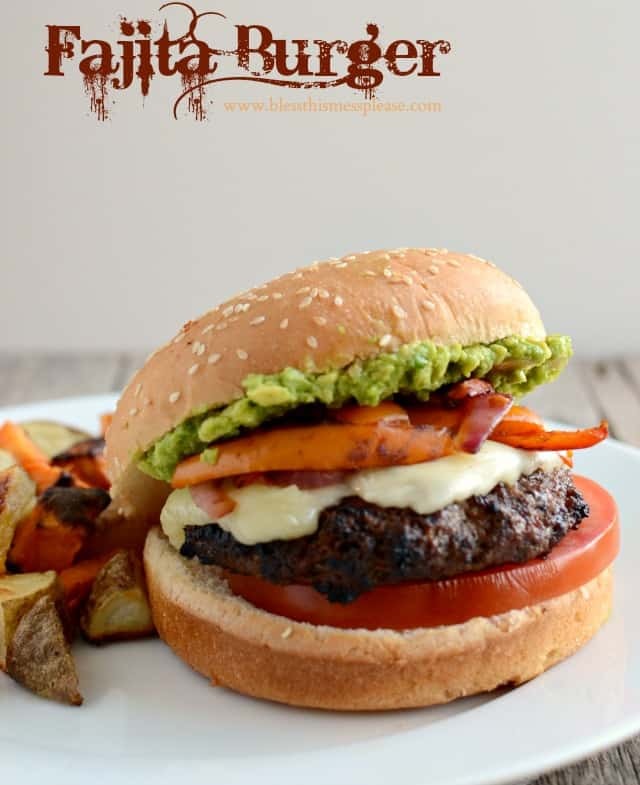 Fajita veggies and guacamole sounds like a heavenly combo for a burger!! This is genius and I need to make it STAT! I’m loving this #burgerweek!!! You’ve done it! I would *love* that burger. Anything with guac on it has my heart. Looks fantastic, Melissa! Whoaaaaaa. I would LOVE that burger, I’m sure of it. What an awesome burger idea, love this!! Yummy! Love fajitas and a burger with those flavours just has to be good. Gosh, I would do anything for guac and those fajita veggies! Great burger! We are trying this! Thanks!